Good Night Stories for Rebel Girls is a children's book series, that consists of Volume 1 and Volume 2. Each book is packed with 100 bedtime stories about the life of 100 extraordinary women from the past and the present and is illustrated by female artists from all over the world. 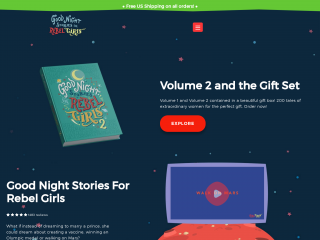 The unique narrative style of "Good Night Stories for Rebel Girls" transforms each biography into a fairy-tale, filling the readers with wonder and with a burning curiosity to know more about each hero. Each story also has a full-page, full-color portrait that captures the spirit of the portrayed hero.